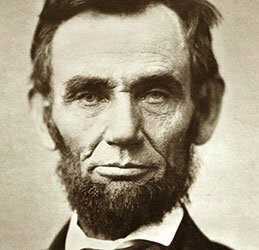 To Southerners it was known as the War of Northern Aggression, while those to the North of the Mason-Dixon lines referred to the War of Rebellion. Even 150 years after General Lee’s surrender at Appomattox, deep wounds remain from America’s most bloody conflict. Harvard’s response to this significant anniversary first recognizes that its students who died fighting for the Union were not its only victims of the conflict. “Deep Wounds,” a multimedia exhibit continuing through May 7th” is a large-scale, site-specific interactive installation by artist Brian Knep. 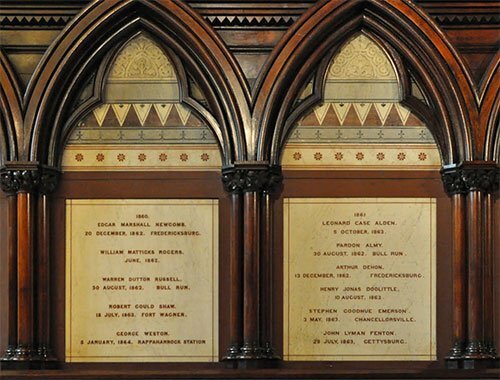 With names inscribed on its marble walls, the transept at Memorial Hall honors Harvard alumni who died in the Civil War while fighting for the Union. Using computer-generated projection technology, “Deep Wounds” uses this historic space to explore the universal challenge of unfinished healing and reconciliation, among enemies formerly bound by the ties of friendship, family, or shared experience. Commissioned and presented by the OFA Public Art Program. Memorial Hall, 45 Quincy St., Cambridge. Hours: Monday-Friday, 10-6 pm; Saturday and Sunday, 12-6 pm (except April 5 and 19). Admission free; more information; 617.495.8676. Two musical responses to the conflict also look to be moving and important. On May 2, 8 pm: “Memory’s Keeping: David Lang’s battle hymns,” New England premiere of Pulitzer Prize-winning composition featuring Harvard Dance Project (Jill Johnson, Artistic Director), Harvard-Radcliffe Collegium Musicum (Andrew Clark, Conductor) and Boston Children’s Chorus (Anthony Trecek-King, Artistic Director). Lang’s work sets a collage of texts meditating on the experience of war: a speech of Abraham Lincoln, parlor songs of Stephen Foster, and a soldier’s letter to his wife. The performance also includes Jeffrey Van’s A Procession Winding Around Me, featuring the composer accompanying the chorus on classical guitar, and the premiere of multiple new works by Harvard student composers, including one by Evan O’Dorney, the winner of HRCM’s inaugural student choral composition competition: a setting of Oliver Wendell Holmes’s Hymn, written for Memorial Hall’s cornerstone laying ceremony in 1870. The performance at Sanders Theater will cost $20. Harvard-Radcliffe Chorus will present “A Heartrending Cry: Dona Nobis Pacem of Ralph Vaughan Williams” along with William Schuman’s A Free Song on May 3rd at 4 at Sander’s Theater. Edward Elwyn Jones will conduct Boston Modern Orchestra Project with soloists Deborah Selig, soprano; and Paul Max Tipton, baritone. Tickets are $20. English composer Vaughan Williams was 64 years old when he wrote Dona Nobis Pacem in 1936; however, his experience of World War I remained vivid in his memory. This work sounded a fervent warning at a time when Europe was moving toward another catastrophic war, and made an uplifting plea for peace. Three poems of Walt Whitman are framed by words from the Latin Mass, the Old Testament prophets, and the famous House of Commons speech made during the Crimean War by John Bright. The concert will also feature William Schuman’s A Free Song, which also sets Whitman text, was premiered by the Harvard choral program, and was awarded the first Pulitzer Prize in Music in 1943. FWIW, the usage “War of Northern Aggression” as a proper noun dates back less than 60 years. Southerners did not use it that way during or in the generations immediately after the war. How wonderful that Harvard is focusing on the topic of war. Music is the perfect language to describe the horrible effects of wars. Wars destroy not only those who fight in them, but all of society who has to live with its high economic and human cost. With music we celebrate the best of human nature, cooperation, tolerance, unity, and love through dedication. Violence is devoid of true power.